12 Jan 2016 Washington D.C. But a review of Paul Ryan’s record demonstrates a two-decade history of pushing amnesty and mass immigration. In fact, Ryan has developed perhaps the most open borders record in Congress– for members of either party. And Ryan was instrumental in blocking an effort to reduce immigration in the 1990’s, changing forever the course of American history. In the interview with Tapper, Ryan was asked about criticisms levied against him by GOP frontrunner Donald Trump for being “weak on immigration: “Frankly I’m disappointed that he’s weak on immigration, he’s weak on the border, and he’s in favor of amnesty, so I have my disappointments with him,” Trump said of Ryan. Ryan’s declaration, which went unchallenged by Tapper, contradicts the entire history of Ryan’s career. Indeed, as recently as just last month, Speaker Ryan ushered through Congress an omnibus spending bill that completely funded President Obama’s still-running 2012 executive amnesty for DREAMers. His bill also gave federal grants to sanctuary cities, as well as funding the resettlement of illegal aliens within the United States, the release of criminal aliens, and tax credits for illegal aliens. Meanwhile, Ryan’s omnibus failed to provide funding for the mandatory completion of a 700-mile double-layer border fence that Congress promised the American people with the 2006 Secure Fence Act—even as Speaker Ryan constructed his own border-guarded security fence around his posh mansion in Janesville, Wisconsin. Yet far from simply funding amnesty, Ryan’s omnibus funded an expansion of immigration levels. Ryan’s spending bill funded an expansion of Muslim migration, bringing the total number of visas for Muslim migrants this year (temporary and permanent) to about 300,000. His omnibus also expanded a controversial low-skilled H-2B guest worker program, which immigration attorney Ian Smith has explained will disproportionately “hurt America’s most vulnerable workers.” Without providing any evidence to support his claim, Ryan sought to justify the controversial provision by declaring that American “businesses would have shut down with this” provision “because they couldn’t get the labor.” Ryan made this claim despite the fact that 92 million Americans are currently outside the labor force. It’s especially disappointing that the new House leadership, in fewer than two months on the job, broke its promise not to bring major immigration legislation to the floor this year. One must wonder how many other promises in the Capitol have an expiration date. But one need not wonder why our voters are in open rebellion and our presidential candidates are successfully running against Congress. He’s absolutely wrong. I think all the polls show that the country is with Donald Trump on that issue… It is certainly not our duty to let in everybody who wants to come to this country. Probably the whole world wants to come into this country… We need to respect the will of the majority. Republicans ought to be a grassroots party. And the grassroots certainly agree with Donald Trump on most issues, but certainly on the immigration issue. Ryan’s record of pushing for open borders immigration policies extends far beyond just the past few months. Indeed, Ryan’s effort to expand America’s immigration levels beyond all known historical precedent dates back more than two decades. Bloomberg’s John Heilemann’s previous reporting documents Beck’s declaration. “[Ryan’s] ties to the pro-immigration mafia ran deep,” Heilemann wrote nearly two decades ago. In a 1996 piece for Wired magazine, Heilemann detailed Ryan’s involvement in the effort to kill the bipartisan push to curb immigration— led by Republican Congressman Lamar Smith and inspired by Civil Rights champion and late-Democratic Congresswoman Barbara Jordan. Ryan is a part of the group that created the massive immigration problem facing the nation today. As a direct result of Paul Ryan and Sam Brownback, there are an additional 10 million immigrants in the country [than we otherwise would have]… If not for the Ryan and Brownback efforts, we wouldn’t even be debating illegal immigration today. During the mid-90s, the illegal population was less than 5 million. If E-Verify had been implemented that point, we would not have so many illegal immigrants in the country today. The whole illegal immigration problem is the responsibility of Brownback. [Ryan] worked to water down the strict immigration limits in a bill Lamar Smith, Texas Republican, was working to pass in the mid-1990s… As a staffer in Washington, he worked for Jack Kemp and Sen. Sam Brownback — both of whom were part of the Republicans’ pro-immigration wing, and who fought crackdown efforts from within their own party… As a congressman, he voted for a 2002 legalization bill, praised the 2006 Senate immigration bill backed by Mr. Bush and co-sponsored a 2009 Democratic bill that would have legalized immigrant farmworkers. More recently, in 2013, Ryan became one of Congress’s most ardent champions of Barack Obama, Marco Rubio, and Chuck Schumer’s shared immigration agenda. Ryan became Sen. Rubio’s counterpart in the House for leading the charge to enact Obama’s vision of never-ending mass immigration into law. Indeed, shortly thereafter Paul Ryan joined forces with open-borders advocate Luis Gutierrez— who once declared, “I have only one loyalty…and that’s to the immigrant community”— to stump for Marco Rubio’s immigration agenda. 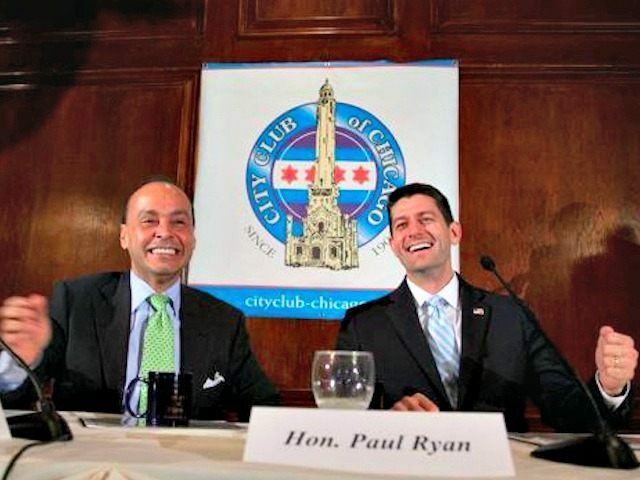 In fact, the two developed such a good relationship over the years that Gutierrez was one of Ryan’s earliest endorsements for House Speaker. Ryan’s Speakership was subsequently backed by other Democrats, such as Harry Reid and Xavier Becerra, before Congressman Jim Jordan, Mick Mulvaney, and the House Freedom Caucus helped push Paul Ryan over the finish line and into the Speaker’s chair. In a separate video with Gutierrez, Ryan made the case for open borders—declaring unabashedly, “America is more than just a country… It’s more than our borders. America is an idea. It’s a very precious idea.” As Breitbart has previously explained, this statement is significant because, while a country has borders, “ideas” do not. If America is an “idea” rather than a “country,” then refugees in Somali have as much “right” to a job in the United States as do children whose ancestors fought in the American revolution. Ryan continued, “We want an economic based immigration system where… labor and supply and demand can meet each other so we can help fuel our economy and create jobs.” Ryan’s declaration represents the essence of the open borders philosophy. Under this global one-world theory, any willing employer should be able to hire any willing worker regardless of what country they live in. This view– that America is an “idea” and not a “nation”– sees borders as an obstacle to commerce. Sen. Rubio echoed a similar refrain earlier this year in the first Republican debate, in which he complained that the nation’s federal immigration policy does not do enough to serve the interests of foreign citizens living in foreign countries who call Sen. Rubio’s office because the wait times for entry are too long. A PBS Frontline documentary, which aired in October of 2015, further exposed the details of Gutierrez and Ryan’s push to pass amnesty. Gutierrez told filmmakers that their collaboration had to be conducted in secret, so as not to tip off Republican voters. “You feel like you have to kind of sneak around to have dinner with these guys,” Gutierrez’s communications director, Douglas Rivlin, said, referring to his secret meetings with House Republicans to push amnesty. “Unlike some of you [expletive deleted], I don’t mess around with my wife, so–but let me tell you–right? I feel like I’m sneaking around right on my party … when I have dinner with you guys,” he said. Put yourself in another person’s shoes, which if you’re in elected office, that’s what you kind of have to do that almost every single day… what we do is we take different people’s perspectives. The gentleman from India who’s waiting for his green card. The DREAMer who is waiting. We take all these different perspectives. We process it through our values and our morals and our principles. And then we come up with the answer to try and solve this problem. 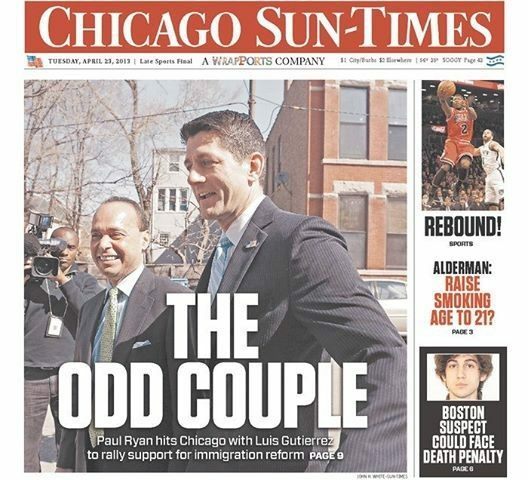 Indeed, immigration is not the only issue where Paul Ryan backed President Obama. Like Sen. Rubio, Paul Ryan was vocal in his support for giving President Obama fast-track authority and the Trans-Pacific Partnership (TPP). Fast-track allows international trade deals like TPP to be pushed through Congress without having to face Senate filibusters, treaty votes, or amendments. Rubio even called the TPP a “pillar” of his Presidency. As Chairman of the House Ways and Means Committee, Ryan was essential to Congress’ passage of fast-track. At the time, Politico described passing fast-track as “the fight of Paul Ryan’s career”—one which, like his push for Obama and Rubio’s immigration agenda, at times had to be conducted “quite stealthily”. Tonight, Paul Ryan will be seen sitting behind President Obama’s shoulder as the President addresses the nation and articulates his vision for the same trade, crime, and immigration policies shared by Speaker Ryan. The Washington Post recently reported that “Paul Ryan is rapidly emerging as Republicans’ anti-Trump.” Indeed, the Ryan-Rubio wing of the Republican Party—with its emphasis on importing cheaper foreign goods and labor into the country, combined with its unwavering commitment to a doctrine of interventionist foreign policy—seems diametrically opposed to the Trump wing of the Republican Party, which addresses culture and quality of life issues facing everyday American citizens, such as a immigration, trade, and crime. So far, these issues have yet to come up in any great depth in any of the GOP debates. It will be interesting to see if that changes on Thursday’s debate hosted by FOX Business.